Project 90 came into my life at a time when I was really struggling to return to some kind of fitness groove. Prior to having my third child I was in the best shape of my life. I was coming off a great year of PR’s (personal records) in both the half and full marathon, as well as completing my first 70.3 Ironman triathlon. My return to fitness after my son was born was anything but spectacular. In fact, it was downright frustrating. I was slow, overweight and constantly discouraged at the effort I was putting in with minimal progress to show for it. My first half marathon post-pregnancy was one of the most difficult races I have ever run, both physically and mentally. When my friend suggested we sign up for Project 90 together a few months later, I was ready to try anything to get my fitness back to where I knew it could be. Project 90 was a game changer! Having been an athlete the majority of my life, I thought I knew a lot about what my body needed. Project 90 was a wake-up call for me in so many ways. I soon learned that I was running myself way too hard, not fueling well, and not recovering effectively from my workouts. I was also introduced to the concepts of proper cadence and heart rate to become a more efficient runner. It was difficult at first to get my head wrapped around the concept of running for time rather than miles. It was even harder to accept a much slower running pace to keep my heart rate where it needed to be! The true beauty of the program is in its simplicity though. Run 90 cadence and keep your heart rate where it needs to be, and over time the results will amaze you! I had so much fun watching my pace improve as my body became much more efficient in my target heart rate zone. By the end of the 90 days I was running faster than when I started, and was feeling so much better overall. I loved the multi-faceted aspect of the program as well, which incorporated a nutrition component and other helpful information. I am proud to say that I broke my Coca-Cola addiction during the two week "test" and have not touched a carbonated drink of any kind in almost a year! As I learned to fuel my body correctly and train at an appropriate heart rate, my pregnancy weight finally started to drop off. The 90 days flew by and the endurance challenge arrived before I knew it. I went into the Endurance Challenge with a goal of running 30 miles, and surprised myself by completing 42.5 miles. It has been an amazing journey this past year to watch my running be completely transformed as I continue to focus on my heart rate and form. My workouts no longer end because I am tired, but because I run out of time! At 35 years old I am faster than I have ever been in my life. I’ve continued to set PR’s in multiple distances, am currently under my pre-pregnancy weight, and have remained injury free. 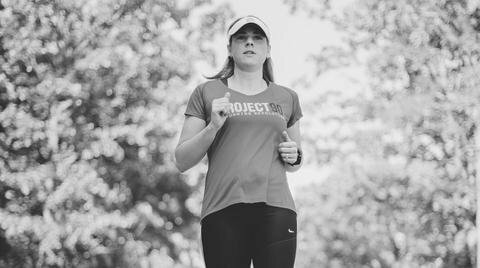 Project 90 was instrumental in helping me regain my fitness and renew my passion for running and endurance sports. I am so thankful for the guidance and expertise from the Gearhead staff and would highly recommend Project 90 to runners of all levels.